Raised on a ranch with the values and work ethic of a cowboy, Benjamin "Montana" Raines is as loyal and hard-working as they come and trusts his navy SEAL family with his life. When the nation’s security is at risk, he joins forces with jaded, beautiful CIA agent Kate McKenzie to uncover a devastating conspiracy. When Caroline wakes up with amnesia in a hotel room with the body of a known drug dealer, she’s desperate to unravel the mystery of her missing memories. But she’s not sure if she can trust DEA agent Cole Pierson—is his trust in her deep enough that he’ll help her keep her freedom? Police therapist Andrea McNeil has a policy about not getting involved with law enforcement after her cop husband is killed in the line of duty. But when her son is kidnapped, she turns to FBI agent Jack Prescott, a client of hers who has the expertise to help save her son—and maybe her along the way. 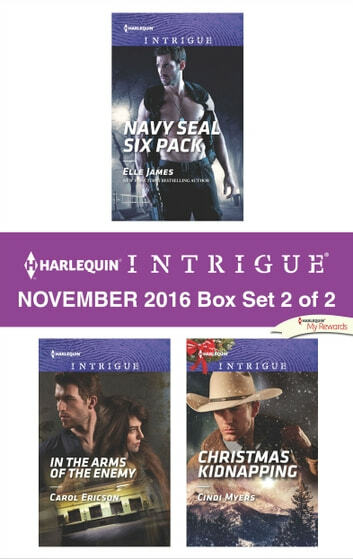 Look for Harlequin Intrigue’s November 2016 Box set 1 of 2, filled with even more edge-of-your seat romantic suspense!